The gospel is not merely about Jesus Christ. Jesus Christ is the gospel. Solus Christus means that salvation comes to sinners “through Christ alone.” Salvation, to be sure, involves professing those doctrines we hold to be true, but it also involves receiving in our hearts the divine-human person, in whom are all the benefits of redemption. Although Scripture does not provide any detailed public policy agenda for New Testament believers, it does teach a number of important things about civil government. Thus, Christian doctrine rightly includes teaching about governmental authority, as reflected in our Confession of Faith. As Protestants committed to proclaiming the whole counsel of God, we Orthodox Presbyterians have spent the last year reflecting on our Reformation heritage. 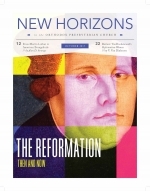 A series of articles in New Horizons has sought to present to the church both the history of what Luther, Calvin, and others left to us and the abiding relevance of that inheritance.